As you travel downstream from the Neponset Reservoir in Foxboro, you notice Gillette Stadium, home of the New England Patriots and New England Revolution. It was during the Stadium’s construction that almost one-third-mile of “dead” Neponset River was brought back to life. For more than four decades, two sections of the Neponset River had been placed in an underground pipe (“culverted”) for a total length of more than 2,000 feet beneath the parking lots at the old stadium, making just a brief above-ground appearance as it bubbled through the center of the former Foxboro Raceway horseracing track. Newly daylighted and re-routed Neponset River at Gillette Stadium. Consider that a natural, free-flowing river teems with living things that help to purify pollutants, provide important wildlife habitat and recreational amenities, and recharge groundwater. Burying or culverting a river is the surest way to kill a river. A culverted stream has no light, little biological activity and invariably gets treated as a sewer, receiving flow from all sorts of polluted discharge pipes. In the 1990s, it was clear that the Neponset River was more or less “dead” as it passed through the old stadium site. 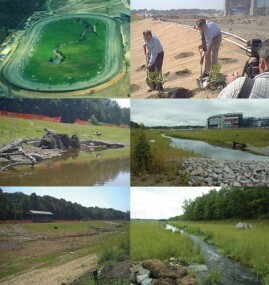 Process of Neponset River daylighting and restoration at Gillette Stadium. Working their way rapidly through a normally complex permitting process, the Patriots created a new, protected river corridor along the edge of their property, complete with native plants, riffles and pools, and even dead tree stumps (an important fish habitat feature). Now, this revived section of the Neponset River, constructed only a few years ago, is home to a variety of wildlife, as it makes gentle turns through an attractive vegetated corridor alongside the Stadium parking lot. The daylighting of this section of the Neponset River is a great example of how innovative developers can and do create opportunities to restore the Neponset River Watershed, and in this case – literally bring it back to life. Click here to view PowerPoint of the Neponset River Daylighting Project.